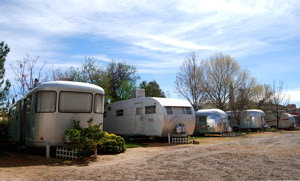 Y'all have GOT to visit this most amazing vintage trailer park in Bisbee, Arizona. I had the Shady Dell on my list of "must see's" for too long, and finally made the journey. It was better than I had even hoped for. The park has new owners, Justin & Jennifer and they have big plans for the future. I stayed in the 1951 Royal Mansion for two days and had a ball! Check it out! 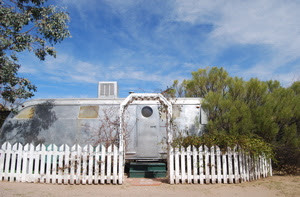 Hi Kristiana...you shiny-silver-jewelry-designer-trailer-lovin' kinda gal! HI....so glad you have made your way down to The Shady Dell. I was just introduced to you by my daughter who sent me a photo of her wearing your adorable silver "Lucky lil' Trailer" necklace. YES, my daughter is Jen, who is now living, working and loving being with Justin as they run The Shady Dell together. My husband and I were just down there last week, and it was Daves' 1st time, my 3rd. What a fun place. We are in our mid-fifties and HELLO memories! I cry each time I'm there just reminising my past. Bisbee is fun too, touring the historic sites, antique shopping, 2nd hand shopping, and eating in their great restaurants. Santiagos, and Rosas' YUM! We even took a side trip through Sierra Vista on to Elgin to two fun wineries. Great times. Your jewelry site is full of great finds...and I've just hinted to Jen about checking out your rings, especially the womens & mens matching comfy looking bands. So simple, so smooth, look so beautiful. I will hint hint to my son Scott, who lives up here in Washington State near me. Just wanted to put in a little comment, and thank you for adding The Shady Dell to your blog. Hope others see The Dell, and continue to spread the word. We will help promote your silver jewelry line too. Thank you for your kindness to Jen'n'Justin during your stay. Lover of Life, Love, Design, and Shine! All text and photos are Copyright Kristiana Spaulding. Please use photo credits. Powered by Blogger.